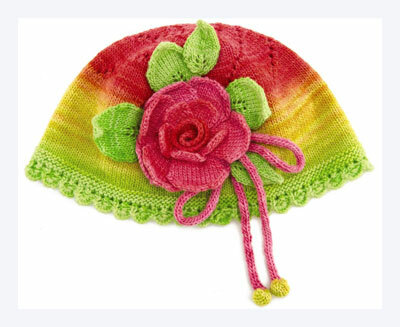 The trick to knitting this hat is to break off lengths of each color for future use as you come to them. This pattern uses long-repeat, self-striping yarn, which is engineered to begin and end with the same colors each time. A lacy edging and openwork spiral decreases further complement this cabbage rose appliqué, with its millinery-style bow detail. CO 304 sts using cable CO. PM and join for working in rnds. Next rnd: *K7, pass 2nd, 3rd, 4th, 5th, 6th, and 7th sts on right needle over first st, yo, k1, yo; rep from * to end of rnd — 152 sts. Knit 1 rnd, ending 1 st before end of rnd. PM for new beg of rnd (remove old M when you come to it). Next rnd: *Sl1, k2tog, psso, yo, k1, yo; rep from * to end of rnd. [Knit 1 rnd, purl 1 rnd] 3 times. Work even in St st until piece measures 4″ from CO, breaking off 4 yd. of yellow and 5 yd. of orange, when possible. As you work, the color of the yarn will slowly change. When the strand is mostly yellow, break off 4 yds for later use. Rejoin the ends and continue. When the strand is mostly orange, break off 5 yds for later use. Rejoin the ends and continue. Rnd 1: *K15, k2tog, yo, k2tog; rep from * to end of rnd — 144 sts. Rnd 3: K13, k2tog, yo, k2tog, *k14, k2tog, yo, k2tog; rep from * to last st, k1 — 136 sts. Rnd 5: K11, k2tog, yo, k2tog, *k13, k2tog, yo, k2tog; rep from * to last 2 sts, k2 — 128 sts. 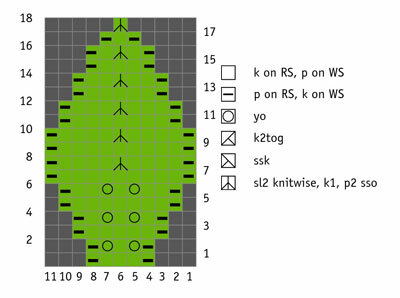 Rnd 7: K9, k2tog, yo, k2tog, *k12, k2tog, yo, k2tog; rep from * to last 3 sts, k3 — 120 sts. Rnd 9: K7, k2tog, yo, k2tog, *k11, k2tog, yo, k2tog; rep from * to last 4 sts, k4 — 112 sts. Rnd 11: K5, k2tog, yo, k2tog, *k10, k2tog, yo, k2tog; rep from * to last 5 sts, k5—104 sts. Rnd 13: K3, k2tog, yo, k2tog, *k9, k2tog, yo, k2tog; rep from * to last 6 sts, k6 — 96 sts. Rnd 15: K1, k2tog, yo, k2tog, *k8, k2tog, yo, k2tog; rep from * to last 7 sts, k7 — 88 sts. 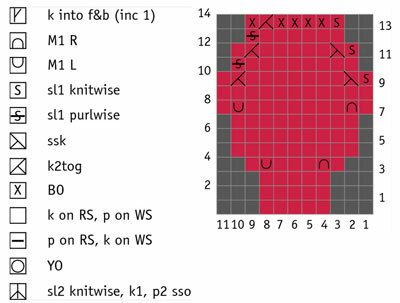 Rnd 16: Knit to last st, PM for new beg of rnd (remove old M when you come to it). Rnd 17: K2tog, yo, k2tog, *k7, k2tog, yo, k2tog; rep from * to last 7 sts, k7 — 80 sts. Rnd 19: K2tog, *k6, k2tog, yo, k2tog; rep from * to last 8 sts, k6, k2tog, yo — 72 sts. Rnd 21: *K5, k2tog, yo, k2tog; rep from * to end of rnd — 64 sts. Rnd 23: K3, k2tog, yo, k2tog, *k4, k2tog, yo, k2tog; rep from * to last st, k1 — 56 sts. Rnd 25: K1, k2tog, yo, k2tog, *k3, k2tog, yo, k2tog; rep from * to last 2 sts, k2 — 48 sts. 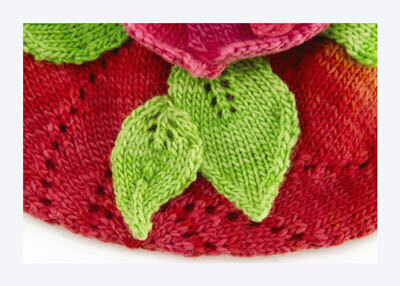 Rnd 26: Knit to last st, PM for new beg of rnd (remove old M when you come to it). Rnd 27: K2tog, yo, k2tog, *k2, k2tog, yo, k2tog; rep from * to last 2 sts, k2 — 40 sts. Rnd 29: K2tog, *k1, k2tog, yo, k2tog; rep from * to last 3 sts, k1, k2tog, yo — 32 sts. Rnd 31: *K2tog, yo; rep from * to end of rnd. Rnd 33: *K2tog; rep from * to end of rnd — 16 sts. Rnd 35: *K2tog; rep from * to end of rnd — 8 sts. Break yarn and thread through tapestry needle. Run needle through last 8 sts and pull snug. Fasten securely and weave in end on WS. (When green is the first color on the ball): Make 3 large leaves, foll the Large Leaf Chart. 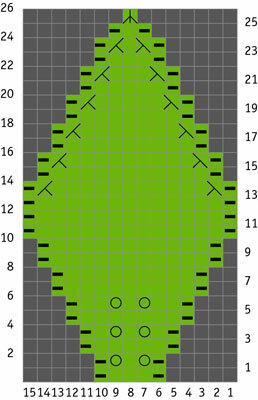 Make 2 small leaves, foll the Small Leaf Chart. With orange, make 1 center, foll Center Chart. With pink, make 5 small petals, foll Small Petal Chart. 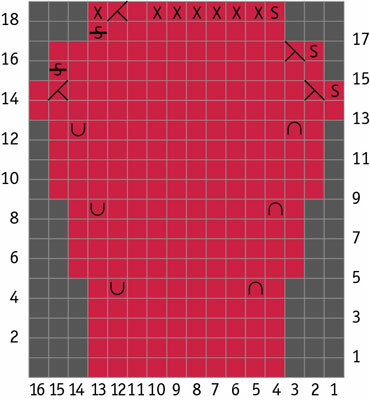 With pink, make 8 large petals, foll Large Petal Chart. 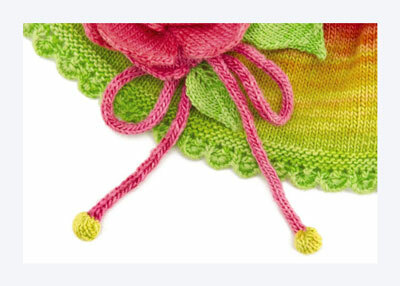 With pink, make a 4-st knitted cord approx 21″ long. CO 8 sts, leaving a 12″ yarn tail at beg of CO.
Work back and forth in St st for 10 rows. Break yarn, leaving a 12″ tail. Thread tail through tapestry needle. Run needle through live sts, then sew running sts around rem 3 sides of piece. Wind yarn tail from CO into a ball small enough to fit inside piece (wrap around one finger). Place yarn tail ball on WS of piece. Pull working end with tapestry needle to snug bobble around filling. Fasten securely to underside of bobble. Make 2nd bobble to match. Sew bobbles to ends of knitted cord. Weave in all ends and block hat and appliqué pieces. Lay center piece flat with right side up. Roll from left to right, keeping lower edge straight. Sew through all layers to hold in place. With RS facing rose center, sew small petals one at a time to rose center. Keep straight lower edges even, and overlap petals. 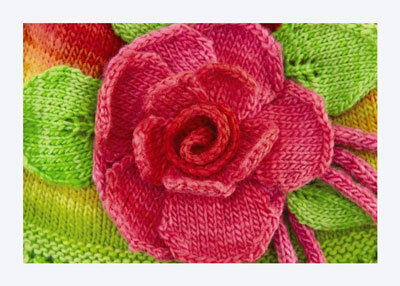 With RS facing backs of small petals, sew large petals one at a time to flower unit. Keep straight lower edges even, and overlap petals. 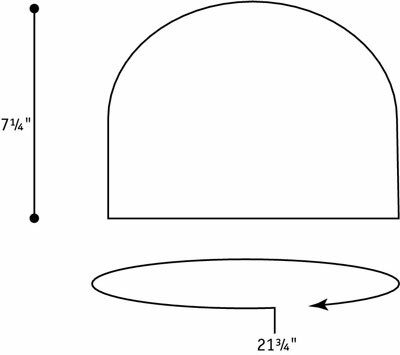 Try on hat or place on hat form. Pin rose in place. 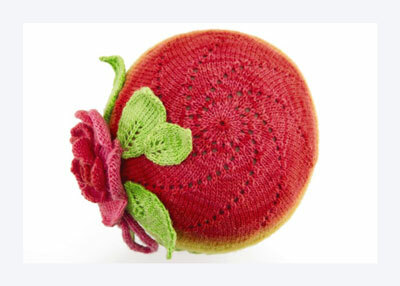 Sew rose to hat, stitching all the way around its base. Pin 3 large leaves and 1 small leaf in place as desired, tucking lower edges under rose petals as shown. Sew in place invisibly, tacking in several places to keep them from flopping forward too much. Form cord into a bow shape and pin to hat. Sew in place. Place last small leaf on top of bow, tucking leaf edge under adjacent rose petal. Sew in place. Don’t actually tie the cord into a bow; a center knot creates too much bulk. Instead, form the loops, cross the ends, and sew in the center to hold securely.